The European Commission has appointed a former lobbyist from the record industry organisation IFPI to be in charge of copyright reform in Europe. 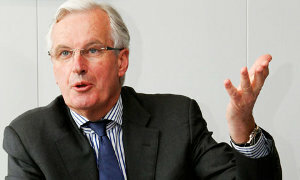 In doing so, the Commissioner responsible, Mr. Michel Barnier, has effectively doomed his flagship project ”The Digital Single Market” to failure. But this is symptomatic of how the EU works in practice. The Digital Single Market is one of the Commission’s flagship projects for this term, and rightly so. The idea is to create a single market for digital products sold over the net, such as music or films. Today there are many legal obstacles that prevent this from being a reality. The European Union is the world’s largest economy, if it is seen as one entity. The 27 member states together have 21% of the world’s GDP, whereas the US only has 20%. If the EU was truly a single market for digital products, this would be a great advantage for European innovators and entrepreneurs. A big home market is always an advantage for a company that wants to launch a new service. This is an area where the EU could be number one in the world. But in reality, we aren’t. The US may be (slightly) smaller than we are, but it is a lot more integrated. A US entrepreneur who wants to sell digital content on the US market only needs one licence, or one set of licences, to cover the entire market. A European entrepreneur who wants to do the same in Europe is forced to get separate licences for each of the member states, in order to be able to sell to the entire European market. In the US, there are several competing services for people who want to buy music online. In Europe, there are none that cover the entire market and treat it as one. Apple observes that its iTunes store is not available in every EU country because many countries do not offer a large enough marketplace to justify the expense and effort required to sell in that country. Since it cannot obtain the rights in the sound recordings and the global repertoire of musical works on a pan-EU basis, iTunes has to examine the situation in each country individually to determine whether the benefits are likely to outweigh the costs of distributing content into that country. The much-hyped Spotify service is seen by many as the answer to the phonographic industry’s problems, and a great European innovation. But in reality, Spotify is only available in 7 of the 27 member states. This is not because Spotify would not want to be pan-European, or because the people who work at Spotify are lazy. They are not. In fact, they have had to work very hard to clear the rights to sell music in the 7 countries where they are allowed to do so. In each country, they have had to negotiate with about half a dozen different collecting societies and rights holders’ organisations to clear the rights to the music they want to sell. Each single piece of music is covered by many different overlapping rights, so unless they can get an agreement with all of the organisations holding different pieces of the rights jigsaw puzzle, they are normally barred from entering that market at all. To get the rights needed for just 7 countries, Spotify has had to spend years of negotiations. Covering all 27 member states will take a very long time, if it ever happens at all. The current copyright legislation of Europe is preventing the Digital Single Market from becoming a reality. The digitization of books is another area where today’s copyright legislation needs to be updated, if we are to take advantage of the exciting possibilities that the new technology has brought. Both Google books and the EU project Europeana would want to make our common cultural heritage available in digital form. If we could solve this, it would be a great thing. Books would become more accessible. Libraries, schools, researchers, and disadvantaged populations would gain access to far more books. Digitization would facilitate the conversion of books to Braille and audio formats, increasing access for individuals with disabilities. Authors and publishers would benefit as well, as new audiences would be generated and new sources of income created. Older books — particularly out-of-print books, many of which are falling apart buried in library stacks — would be preserved and given new life. But to cut a long story short, under today’s European copyright legislation, that just ain’t gonna happen. Clearing the rights for millions of out-of-print books on an individual basis is simply not feasible. New legislation would be needed to untie this Gordian knot. The previous head of copyright at the Commission did in fact present a proposal on legislative changes to facilitate mass digitization of books in Europe. It would not have solved all problems, but it was an attempt at constructive reform to promote a Digital Agenda for Europe. But before the proposal could even be debated in public, the Commission withdrew it. With the appointment of a former IFPI lobbyist as the new head of copyright, we can guess why. IFPI does not want comprehensive copyright reform in any way, shape, or form. They are interested in two things only: an extension of the protection times for the rights that record companies have to recorded music, and stricter enforcement. In those two areas, we can expect to see proposals from the Commission in the coming years. But legislation on orphan works, or a reform of the copyright system to enable the Digital Single Market, are not on the lobbyist’s agenda. They prefer for things to remain as they are, with themselves at the top of the hill. This is their position as ”stakeholders”. And in the EU, at the end of the day, it is the stakeholders that are calling the shots. You may wonder why Commissioner Michel Barnier, who is officially responsible for the Digital Single Market, would deliberately appoint a head of copyright who will almost certainly not deliver the reforms that would be necessary to make that project a reality. The answer is that he probably does not even realise this is what he is doing. The culture of doing nothing unless it has the approval of the big business stakeholders is so embedded in the fabric of the Commission, that he is unlikely to even have noticed it. In the closed rooms at the Commission, the tradition is very firm. You can ignore citizens at will, but when big business talks, big business gets what it asks for. This is called ”stakeholder dialogues”. In the European Union, it is what we have instead of democracy. The resulting bad legislation and missed opportunities can be seen in a country near you. Tomorrow, Monday, 27th of February, will start in Copenhagen the Digital Single Market conference. It is a good opportunity for the elearningeuropa.info community to have a say in the future evolution of the DSM and the importance of learning in the transformation process that will be questioned during the conference’s two days. Many of us believe that “creating a Digital Single Market in the EU is not only a prerequisite for sustainable growth, but holds a promising prospect for economic growth and jobs in Europe.” Is it enough to believe? How can we transform our beliefs in facts that will support our convictions? Digital Single Market vs Single Market? So what are you waiting for? Is it a problem of implementation which means that we should take for given the political willingness or is it a problem of European governance and alignment of policies? In words of Jorgen Abild Andersen, Director General Telecoms, Danish Business Authority, one central question is: “how can we create a truly Digital Single Market modelled on the single market that celebrates its 20 year Anniversary in 2012?” Does it make sense to make a difference between the SM and the DSM? Shouldn’t it be a priority to change and enrich the definition of the SM to give a strong political signal to the European society? The conference that starts this Monday makes a pledge for creating a fully-fledged European Digital Single Market, i.e. developed or matured to the fullest degree. It is interesting to compare this goal with the first action area of the DAE that calls for ”a vibrant digital single market” i.e. vigorous, lively, and vital but also “characterized by rapid, rhythmic movement back and forth”. Are both terms compatible? This question goes beyond pure semantic. The DSM is a vibrant place and may be never matured to the fullest degree. On this ever changing place, regulations, norms… are likely to be obsolete very quickly and contradictions arise. The 2012 edition of the World Mobile Congress that will also start on Monday in Barcelona brings other contradictions. The GSMA recalls that “mobile operators are forerunners in offering innovative content services in Europe and aim to provide a much wider range of services to satisfy growing consumer demand. A good example is the growth of small, entrepreneurial businesses brought by mobile applications (or “apps”).” It is also true as recalled by the EPC that the absence of price convergence within the digital sector, with mobile communication prices varying on a scale from one to five from lowest (Denmark) to highest (Spain) or the fact that in the last decade, no EU equivalent of Google has emerged are symptomatic of the lack of a DSM. How can we encourage entrepreneurship and at the same time impede entrepreneurship because of higher or fragmented costs? On day 2 a plenary session will focus on the role ICT and smart digital solutions can play “in the transformation of the European economy towards sustainable growth and job creation.” Young people will certainly be one of the key targets of this session. The DAE insists on the potential of the younger generation that will be entering the job market over the next ten years and will have been brought up with digital technologies as a natural aspect of their lives. Is it enough? These ”digital natives” are also brought up with the reality of massive unemployment. How come a digital native can be unemployed on a digitalized single market. What are the aspects of the single market – beyond its digital features – that don’t work? Don’t we expect too much of ICT when other obstacles are to be overcome? Robert Madelin recalls in his post on this blog that the priority is to“improve job prospects for younger people expecially, in the coming months not years.” This means addressing also the job market in a “vibrant way”. It is an exciting task where we should all collaborate to revert the current trends. The labour reform decided in Spain a few weeks ago and aiming at boosting the job market doesn’t mention more flexible working and new technologies as an option for jobs creation. The candidates for the French Presidency don’t mention ICT as a driver for growth and jobs. Two examples that demonstrate the urgency to work also on the awareness side despite the “informal” political consensus. Addressing the transformation that implies the digitalization of the Single Market requires an in depth transformation that goes beyond technical and legal aspects. Highlighting the importance of information and knowledge as key drivers for growth would help put the emphasis not only on high speed access, quality content, multiple devices, big data… but also on education, training and the key competences and values that are required to develop a successful life in a connected world. While talking of values, another feature of the World Mobile Congress – that should be a paradigm of the DSM – is worth observing. Out of the 30 confirmed keynote speakers at the World Mobile Congress in Barcelona, 29 are men. The DSM is also about gender and social inclusion, competences and social values!